AUGUSTA, Maine — Despite seeing their majority shrink by 10 seats after last week’s election, Maine House Democrats on Wednesday re-elected the two returning members of the past session’s leadership team to key posts for the next two years. Rep. Mark Eves of North Berwick won two more years as House speaker, and former assistant majority leader Jeff McCabe of Skowhegan was chosen for majority leader. 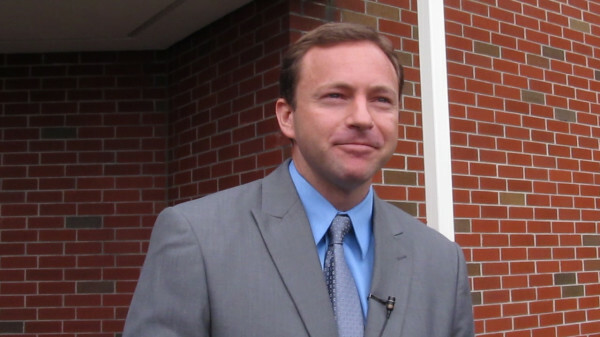 McCabe succeeds Seth Berry, who left the Legislature after serving four consecutive terms representing his district, the maximum allowed under Maine’s term-limits law. Rep. Sara Gideon of Freeport was tapped as assistant House majority leader. Recently elected to her second term, Gideon is a newcomer to legislative leadership. In the Senate, Democrats returned former Senate President Justin Alfond of Portland to the group’s top post of Senate minority leader and elected Appropriations Committee Chairwoman Sen. Dawn Hill of Cape Neddick as assistant minority leader. McCabe turned back a challenge from Rep. Barry Hobbins of Saco, a legislative veteran who was Senate minority leader in the 125th Legislature. Gideon defeated Rep. Lori Fowle of Vassalboro in a contest between two second-term incumbents. With Gov. Paul LePage handily winning re-election and Republicans seizing control of the Maine Senate, the Democrats’ House leaders will encounter great pressure during the next two years. All three members of the party’s new leadership team addressed that fact during speeches to their peers Wednesday. Rep. Peggy Rotundo, a veteran lawmaker from Lewiston, nominated Eves. Eves congratulated his fellow Democrats for maintaining a majority in the House in what he called “one of the most difficult elections in history for our party.” He urged Democrats to seek common ground with Republicans, which turned out to be the theme of Wednesday’s leadership elections. McCabe said “Maine people are tired of gridlock” and partisan political gamesmanship. Hobbins said what many pundits and political experts have surmised about last week’s election: Democrats campaigned too hard against LePage and not enough on their own ideals. In her speech, Fowle said that in addition to pushing Democrats’ policy agenda, the party needs to start focusing on the 2016 elections. Gideon said Democrats need to demonstrate they can achieve results, even with an opposing Senate and governor. House Democrats also unanimously chose Robert Hunt of Yarmouth as House clerk. Longtime clerk Millie MacFarland died in September. Alfond said after being voted in that the coming two years will be tough for Senate Democrats, who are now in the minority. Hill agreed that holding the caucus together will be difficult but crucial. “My intention is to nurture these relationships between us because there cannot be a weak link here — none whatsoever,” she said. Last week, legislative Republicans nominated Sen. Mike Thibodeau of Winterport as Senate president, along with Sen. Garrett Mason of Lisbon Falls as majority leader and Sen. Andre Cushing of Hampden as assistant majority leader. Republicans flipped the majority in the Senate during this year’s elections and lead 20-15. In the House, Republicans re-elected Rep. Ken Fredette of Newport as their minority leader and chose Rep. Ellie Espling of New Gloucester as assistant minority leader. Correction: A previous version of this article incorrectly stated that Rep. Barry Hobbins of Saco was assistant Senate minority leader in the 125th Legislature. He was Senate minority leader.